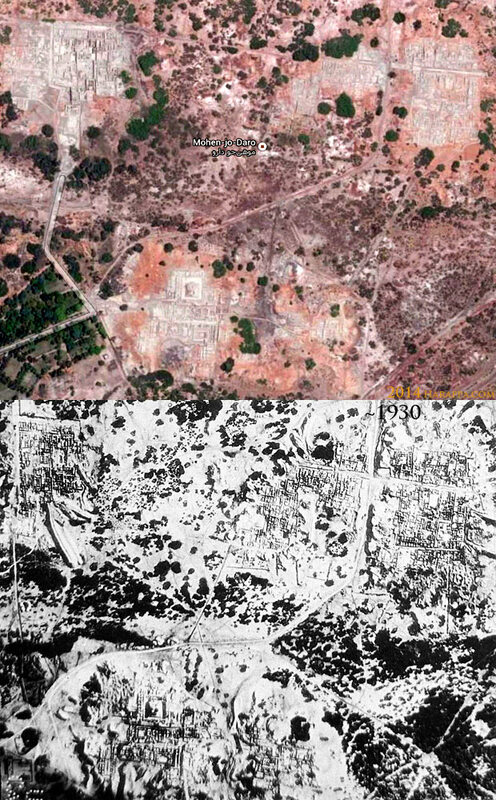 "For the astounding remains of Mohenjo Daro, discovered in 1922 and excavated during the following years, are for the most part in a state of utter disintegration and decay and are rapidly approaching the point of total destruction (compare pls. 1 and 2 , and pls. 9 and 10 )." So wrote J.E. Van Lohuizen-De Leeuw - some 44 years ago in 1973. "There are several causes for this disaster. One of these is the continual threat of the river Indus with its ever shifting course and overflowing banks. One a few years ago the main bund protecting the monuments (see fig. 1) was badly eroded creating a dangerous situation. An even more serious problem is the rising level of the groundwater. When excavations were started in 1922 the water-table was 25 ft. below ground level. But after the gigantic Sukkur Barrage came into operation in 1932/33 (see fig. 2) the situation gradually deteriorated. 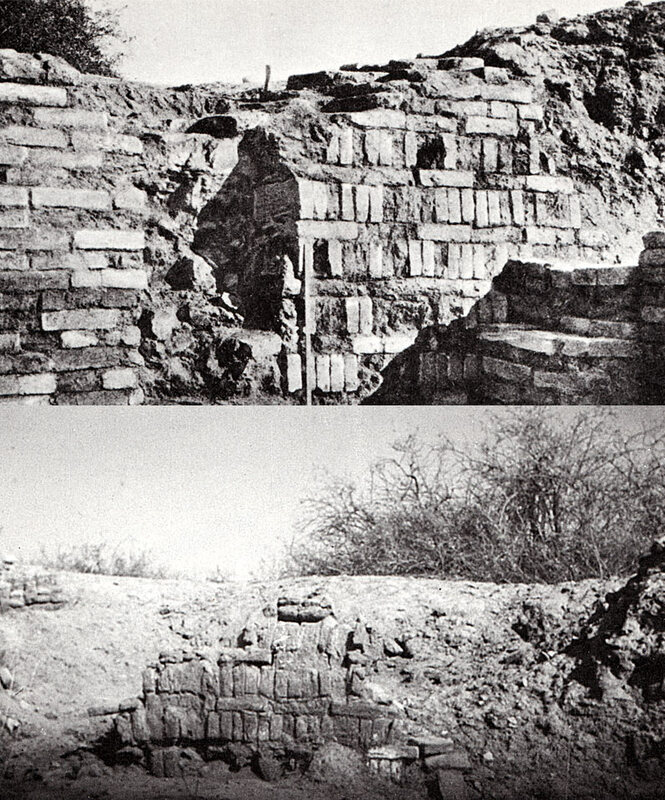 As a result of the enormous amount of irrigation water produced by the new dam, the water-table at Mohenjo Daro rose steadily and it now stands at 12 ft. below ground level in winter and a mere 5 ft. in summer (see fig. 3). This groundwater dissolves various hygroscopic salts, such as sodium sulphate and magnesium sulphate in the lower subsoils, which then creep up to the higher layers as a result of capillary action. Evaporation in Sindh is enormous due to high temperatures, the strong wind and the dry climate. As a results there is a high concentration of salt crystals near the capillary fringe which attacks the bricks in a disastrous manner. If you touch an affected brick it crumbles into dust. I distinctly remember my profound feeling of horror and impending doom when I first noticed this phenomenon more than 22 years ago. But at that time the problem was only just starting to raise its ugly head. Since then the disintegration has reached enormous proportions and Mohenjo Daro, the City of the Dead, is indeed rapidly decaying and approaching its own death." (J.E. Van Lohuizen -De Leeuw, South Asian Archaeology 1983, Leiden, E.J. Brill, 1974, p. 1). 1. VS. Area, Section A, Block I, House II: Floor in shop made of cut and rubbed brick on edge. (Marshall, Mohenjo-daro and the Indus Civilization, III, pl. LIV, a) and above, Same floor as shown below about 45 years later. 2. 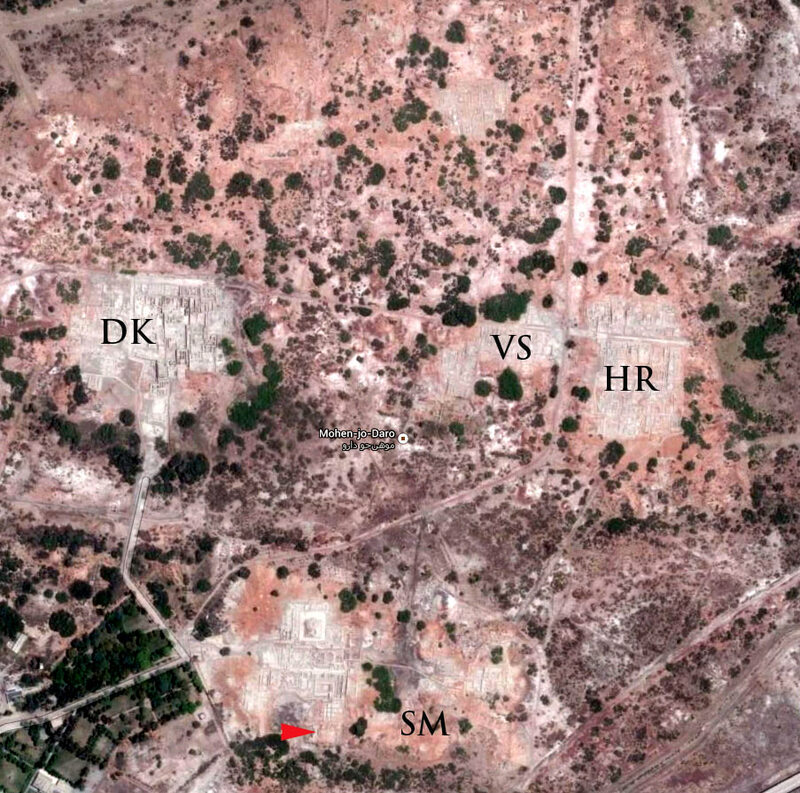 DK Area, Section C, Block 3, northern wall of Chamber 8 built in a decorative bond (Marshall, Mohenjo-daro and the Indus Civilization, III, pl. LXXII, a) and below, Same wall as shown in Pl. 1 [above] about 45 years later. 3. Mohenjo Daro from the Air. 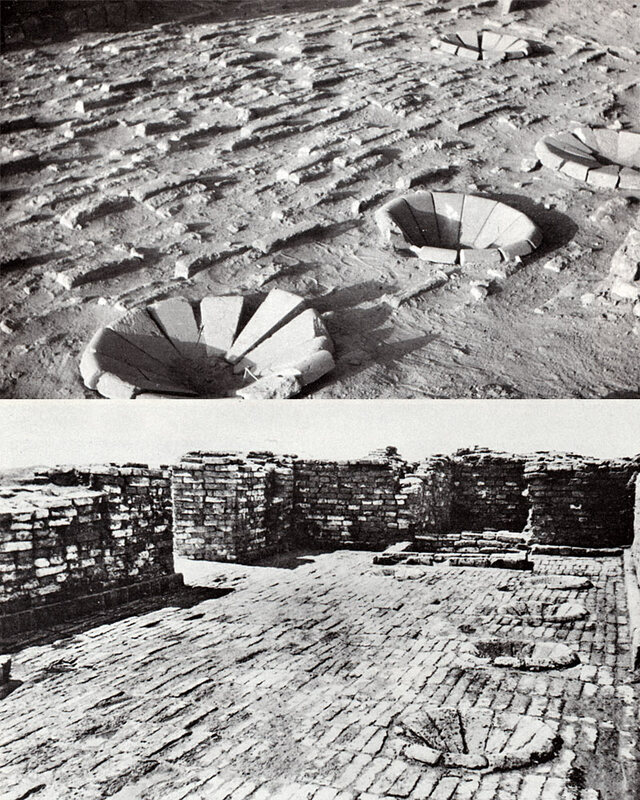 "Originally, the site of Mohenjo Daro must have been much more extensive than it is today and have formed a more closely connected whole, but water and wind, aided by the action of salt in the soil and the extreme aridity of the climate, have combined to eat deeply into the sides and carve deep furrows and hollows through its middle, leaving only here and there mere fragments of later cities," wrote John Marshall.